Suzanne Neville ‘Geddes’ Dress from the Belle Époque 2018 collection. Designed and made in the Knightsbridge flagship store. Stunning, timeless dress with lace panel back and buttons. The dress is couture to fit a UK size 12. The dress is in excellent condiiton and has been fully dry cleaned. 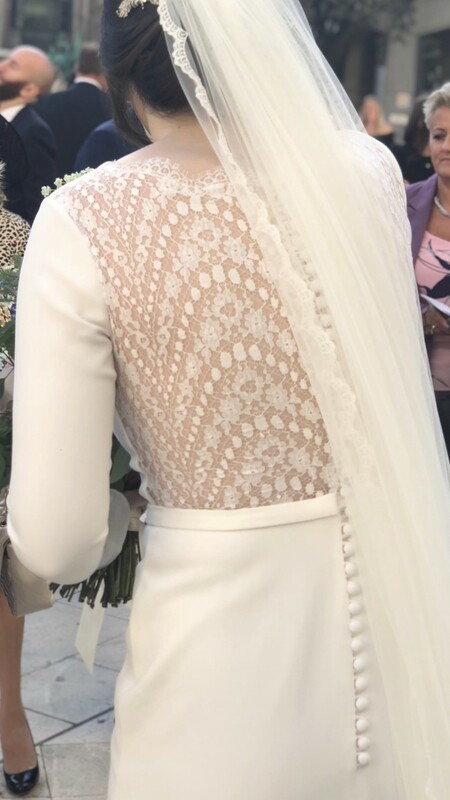 There are some marks at the very bottom of the dress, however the skirt length is 42” (due to me being 6’1” in my wedding shoes) and therefore once taken up the marks wouldn’t show. All sensible offers welcome. Please feel free to ask any questions. Also includes the veil which is a Rainbow Club Italian tulle, lace trim, cathedral length veil.